Celebrate the Chinese New Year or a birthday with this Chinese Zodiac Dragon. Representing power and honor, it is crafted in golden crystal, an auspicious color. Designed in collaboration with artists from the Central Academy of Fine Arts in Beijing, the piece boasts 370 glittering facets. 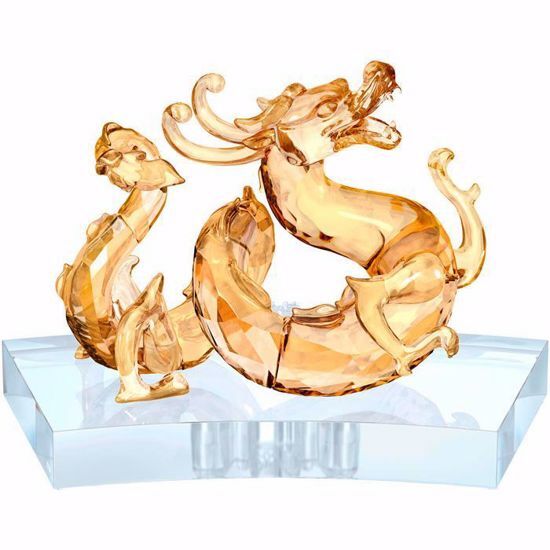 The curved clear crystal base is inspired by the shape of the Huang Jade fans seen in Chinese art and features the Swarovski logo and the Chinese character for ‘dragon’. All 12 signs can be placed together to form a circle symbolizing the endless cycle of life and evoking the Jade Bi artefact used in ancient rituals. Chinese Zodiac leaflet included. Decoration object. Not a toy. Not suitable for children under 15.